Salt left by the evaporation of seawater through the closure of the Mediterranean Sea more than 30 million years ago extrudes at Cardona to form a salt mountain that is unique in Europe. An almost complete diapir outcrops 100 metres high allowing the structural complexity and dissolution processes to be observed. The Cardona salt mountain is dated at around 2 million years having broken through an eroded anticlinal fold that developed much earlier. Visits may be made to galleries under the salt mountain to assist an understanding of economic geology and the mining processes. Fossil footprints can also be identified in the rock face below Cardona castle. One of the most critical and significant events in the geological history of the NE Iberian Peninsula is the final marine regression that sealed the Mediterranean Sea, converting it into an inland basin. The closure of the sea caused evaporation to occur with the consequent accumulation of evaporites. The salts are found between two very different sedimentary environments: a lower sequence of thick predominantly grey sediments with marine fossil fauna and an upper level of reddish-brown clay. Cardona therefore has a special significance since the rocks deposited there provide a very valuable geological record of the drastic modifications in the environment in the space of little more than 5 million years. The Cardona salt mountain has a significance beyond the context of the geological evolution of Catalonia. Within a geological framework it is a very rare example of the evolution of a sedimentary basin where a predominantly marine environment has evolved into an endorreic (closed) system resulting in the evaporation of the sea water. The transformations are recorded in the rock strata revealing the order and depositional sequences of the evaporitic rocks. The composition and concentration of the dissolved salts produce variations within the structure. This is one of the best examples of a saline diapir in which the internal structures naturally outcrop. In addition, there are unique and spectacular karstic solution hollows developed in the salt. The Salt Mountain is found at the foot of the Sierra de Garrigues mountains. It is drained by the Salat stream that joins with the River Cardener. The landscape is deeply incised as a result of the erosion processes linked to the presence of salts. The River Cardener is a tributary of the River Llobregat which supplies 35% of Barcelona's drinking water needs from the Sant Joan Despí Water Treatment Plant. 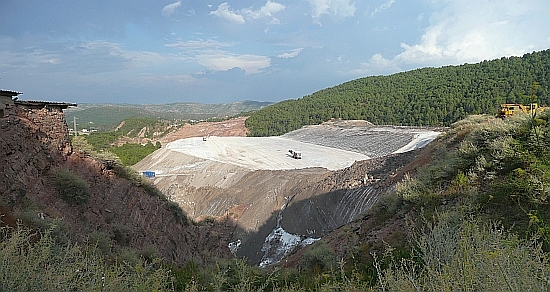 The salt mining in the Llobregat basin has led to a progressive salinisation of the drinking water sources. Since 1989, a Brine Collector, a public works operated by Aigües de Barcelona (AGBAR), has enabled a significant improvement in the quality of the river water used for drinking water production in Barcelona. The land it almost entirely devoted to the split between mining and urban development. The area has PEIN designation making it one of the few examples of protected spaces of natural interest in an intensely populated mining area. Although salt domes are found all over the world where accumulations of evaporitic rocks were later covered by thick beds, the Cardona structures are unique. Many halocinetic movements do not necessarily evolve into diapirs (perforating structures). Moreover, many of them remain hidden at depth and therefore their configuration can only be deduced. The Salt Mountain diapir of Cardona has managed to perforate all the sequence of overlying strata to create a surface relief similar to the way in which rising magma creates volcanoes. This is Europe's only example where the erosion of a Salt Mountain has created outcrops. These outcrops reveal the complex structure of the diapir wall where the processes of salt dissolution can be observed. The general diapir structure can be observed from Cardona castle, with the saline materials occupying the core of the anticline. The Cardona Salt Mountain is considered emblematic of Catalan Geology. Visitors are traditionally interested not only in the geology but also in the spectacular landscape created by the diapir. 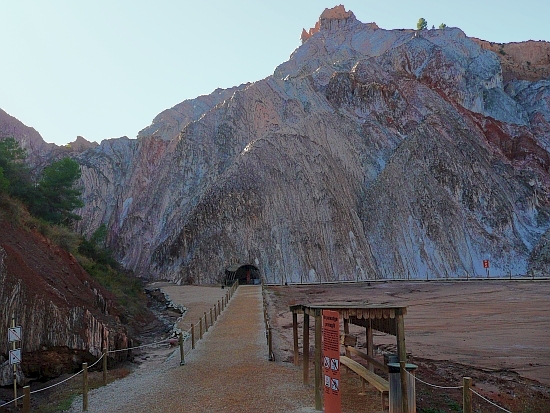 The utilisation of the Mountain of Salt as a geology teaching resource plays a fundamental role in Catalan geological guides and itineraries. The Romans first exploited salt in the area and salt mining contributed to the Cardona economy during the Middle Ages. During the second half of the twentieth century, the exploitation of the diapir for potash generated a new wave of industrial development. Cardona castle dates from the 12th century. In the 17th century it was transformed into a major fortification that was partially destroyed in 1714. Reconstruction took place in the 18th and 19th centuries. 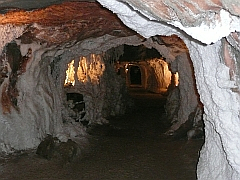 The salt mine at Cardona was closed in 1990 and the Salt Mountain Cultural Park now promotes leisure and tourism activities using salt-related resources. The Salt Mountain Park has a permanent exhibition showing the origins of salt mining in Cardona, mining shafts and mining machinery. 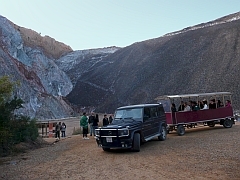 To access the exterior of the salt mountain, visitors are driven in special vehicles down a steep slope to the salt valley. To enter underground, safety helmets are provided and visitors are then able to walk through 500 metres of galleries past spectacular underground scenery and sodium, potassium and magnesium salt seams. A diapir is formed when a thick bed of evaporite minerals (mainly salt) found at depth intrudes vertically upward along fractures or zones of structural weakness into surrounding rock strata to create a dome. The salt that forms the dome was deposited within a closed or partially closed sea. Due to restricted flow of water into the sea, evaporation occurs resulting in the precipitation of salts from solution, depositing evaporites. A sustained period of flooding and evaporation of the sea basin may be required to create the vast quantities of salt found in evaporite deposits. At the present day, evaporite deposits can be seen accumulating in seas that merely have restricted access but do not completely dry out. Over time, the salt is covered with sediment and becomes buried. Since the density of salt is generally less than that of surrounding material, it has a tendency to move upward toward the surface, occasionally breaking through as is the case in Cardona. In cross section, these large domes may be anywhere from 1 to 10 kilometres across and extend as far down as 6.5 kilometres.